Dynamic Glass is a leading Houston-based glass and glazing contractor. 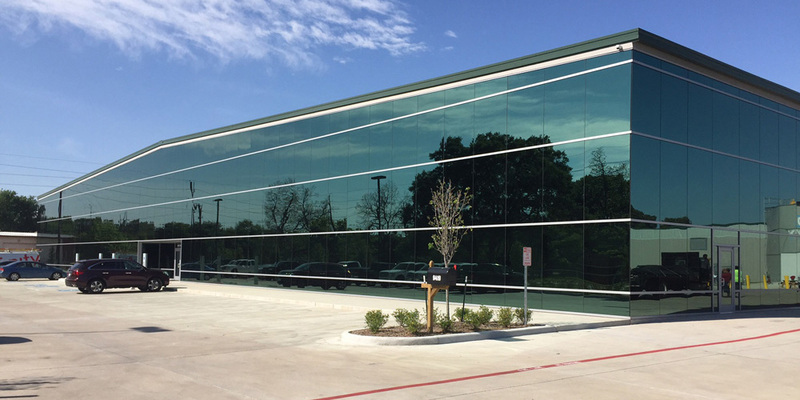 The Company was founded in 1990 by Rick and Chuck Cieslewicz and has since grown into one of the largest glass and glazing contractors in Texas as a result of a reputation for quality work and excellent service. In early 2014, we partnered with Platform Partners, a Houston-based private investment company, to help fund growth initiatives, including several expansions of our now 148,000 sq. ft. state of the art fabrication facility in Houston and 55,000 sq. ft. fabrication facility in Dallas. Our products and services range from exterior curtain wall and aluminum panel solutions to specialty interior glass products. Our core capabilities include the design, engineering, fabrication and installation of glass and aluminum window systems and metal panels. Our long track record of successful projects is a key differentiator in the market, particularly for more complex design build projects. We have installed thousands of floors of exterior and interior glass during our 27+ year history, ranging from basic window wall applications to the most challenging curtain wall systems. We have long standing relationships with leading industry suppliers and a proven track record to ensure a successful outcome. Dynamic Glass provides glass and metal panel products and services across the state of Texas for exterior and interior cladding applications. The exterior division primarily focuses on exterior window systems and metal panels for buildings ranging from 6 to 40 stories. The interior division focuses on interior build outs of office space and small ground up exterior projects. Dynamic Glass self-performs all of its work with trained in-house craftsmen and our two state-of-the art fabrication facilities located in Houston and Dallas comprising over 200,000 sq. ft. of space. We offer a wide range of custom glass and glazing solutions to the exterior and interior construction market. Our in-house capabilities allow us to control every step of the process from design, fabrication and installation to ensure the highest quality product gets installed accurately and safely. Our ability to plan, organize and adapt to construction schedules allows us to consistently complete projects on schedule and on budget. Dynamic Glass is pleased to release our Fall quarterly newsletter. Click attachment below to view the newsletter. Dynamic Glass is pleased to release our Summer quarterly newsletter. Click attachment below to view the newsletter. Dynamic Glass is always looking for qualified candidates who are passionate about safety, quality and superior performance. If you are interested in employment opportunities, please download the Employment Application and fill it out then send it along with your resume to resume@dynamicglass.com. For general inquiries, please contact us using the form below or send an e-mail to info@dynamicglass.com.